In 1983, Oceanwide Expeditions began taking passengers to Spitsbergen and claims to have pioneered the concept of "basecamp" cruising in 2010. (A basecamp voyage includes most of the equipment and gear you'll need to hike, snowshoe, kayak, mountaineer and even camp out overnight.) The cruise fare includes the use of boots and snowshoes, as well as access to all manner of gear to help you enjoy the experience ashore. Oceanwide Expeditions, which sails primarily in Antarctica and the Arctic, is unique in that it owns its own fleet of small ships, all with ice-strengthened hulls, and therefore doesn't have to rely on chartering ships owned by other outfits. This gives the company a high level of control over the experience it can present to its passengers -- whether you travel to the Great White Continent in the Southern Hemisphere or the Arctic in the north. The experience is all about wildlife and nature, and the cruise line programs its itineraries to give you access to as many landings as possible. Also, unique for polar expedition lines, Oceanwide Expeditions has an onboard helicopter on certain itineraries aboard m/v Ortelius. Helicopters aren't the only interesting addition you'll find aboard Oceanwide Expeditions' ships. The company equips its vessels with top-of-the-line gear, such as snowshoes and rubber boots, tents and sleeping bags, kayaks and mountaineering hardware, and scuba tanks and diving compressors for excursions and activities. The intensity of these expeditions can ratchet up or down, depending on what you want to do. You can simply explore via the guided Zodiac excursions, or you can participate in a number of additional activities like hiking, kayaking, snowshoeing and even camping overnight in Antarctica. This is definitely not the type of voyage where you simply gaze out onto the horizon. You'll be out and about each and every day. While your experience may be intense, you'll never feel like you're "roughing it," as Oceanwide Expeditions' ships have plenty of modern conveniences. For example, the fleet has varying degrees of internet accessibility. Some ships have Iridium satellite connections that allow for you to send emails or make telephone calls at your expense. Other ships have Wi-Fi available. For example, m/v Ortelius has Wi-Fi throughout the ship, while m/v Plancius' Observation Lounge has Wi-Fi, and in your cabin, you can connect to the internet via an Ethernet cable. There is also for-fee laundry service on all ships, except for the schooners, s/v Rembrandt van Rijn and s/v Noorderlicht. The vibe onboard is casual, and the crew will make you feel pampered from the moment you join the tour. The chef will even customize meals for you if you have a specific dietary requirement. Just let the line know in advance, and then talk with the hotel manager once onboard. Inclusions vary by itinerary but might include all meals plus snacks, coffee and tea; all shore excursions and activities by Zodiac; onboard lectures; the services of an experienced expedition staff; use of rubber boots and snowshoes; some taxes and port charges; comprehensive pre-departure reading materials; and transfers to and from the ship. Oceanwide Expeditions draws passengers that share a passion for exploration, nature and wildlife. 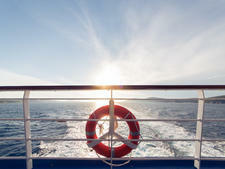 While each voyage might have a slightly different passenger makeup, expect to meet people in their mid-40s to mid-60s. However, it's not unusual to find younger and older passengers onboard, too; fit 80-year-olds have been known to book passage. If you can't walk several hours per day and navigate the steep gangway from the ship to the Zodiac, this might not be the right vacation experience for you. Oceanwide Expeditions passengers are well traveled and especially interested in visiting remote destinations. Friendships form quickly aboard each ship -- even when multiple nationalities are onboard. Solo travelers have options when it comes to booking with the company. You can book a guaranteed single cabin and pay a single supplement of 1.7 times the cruise fare, or you can request that the line find you a roommate with whom you can share a cabin. The company says children must be at least 3 years old in order to join a voyage, and there is no upper age limit. However, due to the remote regions each itinerary explores, all passengers should be in good mental and physical health. This five-ship fleet includes three ice-strengthened vessels that tour the Arctic and Antarctica -- m/v Ortelius, m/v Plancius and m/v Hondius -- plus the three-masted schooner s/v Rembrandt van Rijn and the two-masted s/v Noorderlicht. The 4,090-ton m/v Ortelius started its career in Gdynia, Poland, in 1989. Back then, the ship was called Marina Svetaeva and was part of the fleet for the Russian Academy of Science. The vessel has since been reflagged as Ortelius and accommodates 116 passengers in 53 cabins. This ice-strengthened ship sails itineraries in the Arctic and Antarctica. During certain itineraries, Ortelius has an onboard helicopter for additional excursions (weather permitting). Touring the Arctic and Antarctica, the 3,211-ton m/v Plancius also caters to 116 passengers. Originally an oceanographic research vessel for the Royal Dutch Navy, the ship debuted in 1976 and sailed for the navy through June 2004. Oceanwide Expeditions rebuilt the ship in 2009 so that it complies with the latest SOLAS (Safety of Life at Sea) regulations. The ice-class ship flies the Dutch flag. The line worked with Croatian shipbuilder Brodosplit to create 5,590-ton m/v Hondius, which debuted in 2019. The ship, which sails the polar regions, is Polar Class 6 and accommodates 178 passengers in 84 cabins. The line also owns a pair of masted schooners. The 435-ton s/v Rembrandt van Rijn is a three-masted ship that accommodates 33 passengers in 16 cabins. Oceanwide Expeditions says the ship was built in the last century as a herring lugger. It was rebuilt in the Netherlands in 1994 and sailed around Spitsbergen until 1996, touring the Galapagos from 1998 through 2001. In 2011, the ship was completely rebuilt and refurbished; it currently offers voyages in the Arctic and Greenland. The line's second schooner, 300-ton s/v Noorderlicht has a storied history. Built in 1910 in Flensburg, Germany, as a three-masted schooner, the ship was re-rigged and refitted in 1991 to be two-masted. The ship sails Spitsbergen and Norway and can accommodate 20 passengers in 10 cabins.